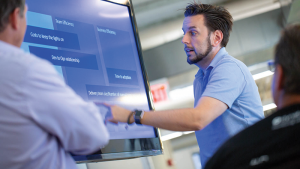 In my previous blog I addressed how we use Dynatrace on Dynatrace in our Continuous Functional Testing Environment. During that same visit to our engineering lab in Linz, Austria I also spoke with Thomas Steinmaurer, Performance Architect for Dynatrace. He oversees our Continuous Performance Environment. Dynatrace builds are deployed daily. Different load patterns are constantly running simulating traffic of thousands of agents. For this purpose we wrote our own performance testing tool because we have some special requirements to simulate that type of load. 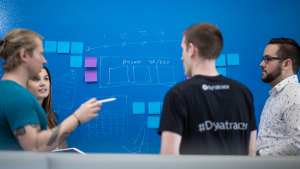 Like Stefan, who told me his story about how Dynatrace helps him to get faster feedback on continuous functional tests, Thomas told me how Dynatrace helps him detecting performance regressions introduced through code changes from build to build. Via our automated provisioning layer “Cloud Control”, Thomas deploys a new build into his Continuous Performance Environment every day. He runs different load patterns throughout the day, e.g: one that simulates high volume of PurePath related data vs. one that simulates a very high volume of infrastructure metrics. Both have different performance characteristics on the Dynatrace Server and the database back end due to the way data it must be processed. Key Performance Metrics for a Service, Process or Host make up a “Performance Signature” which we can compare across builds. 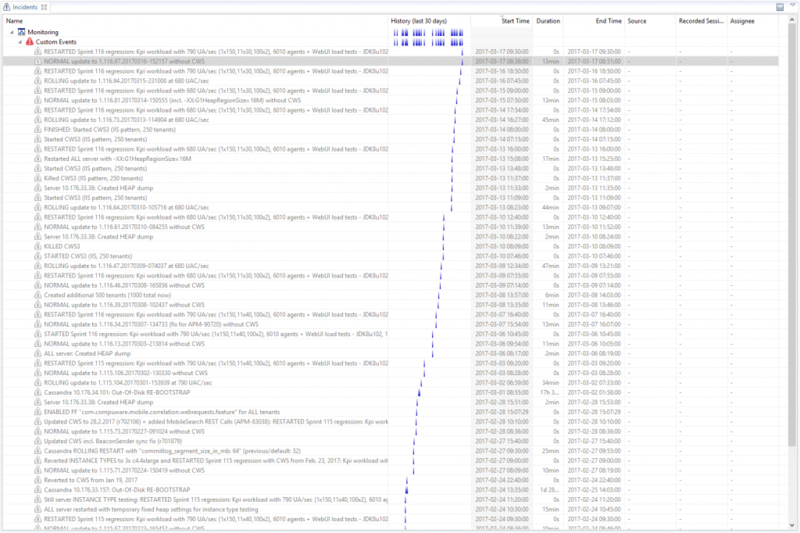 The dashboard above shows basic performance metrics for a “custom service” – the Correlation Engine Periodic Worker. You can see the marked timeframes on Nov 16 and Nov 17. 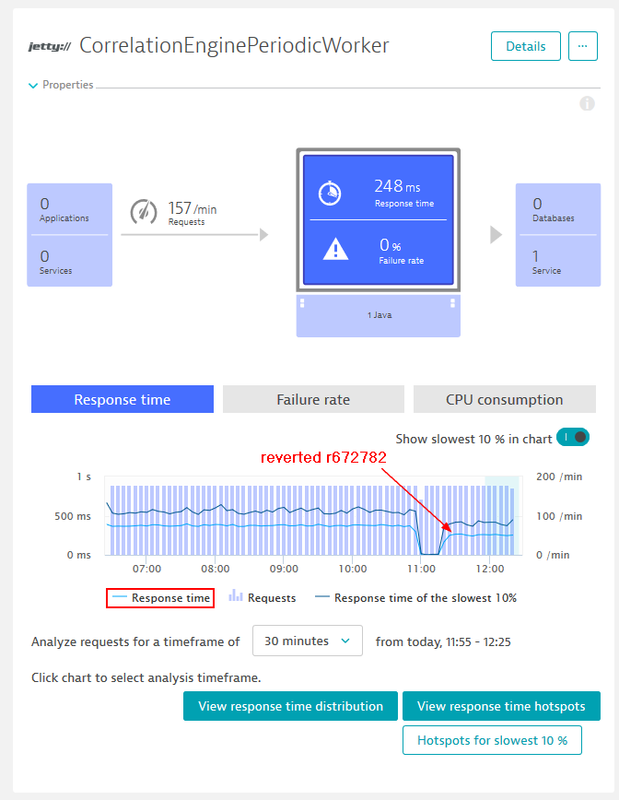 These are the results when he ran the Load Test that had less throughput but required higher processing, thus resulting in a higher response time. However, the change that was introduced in Build Nov 16, deployed on Nov 16 evening and running overnight, clearly shows a totally different “Performance Signature” of the build. 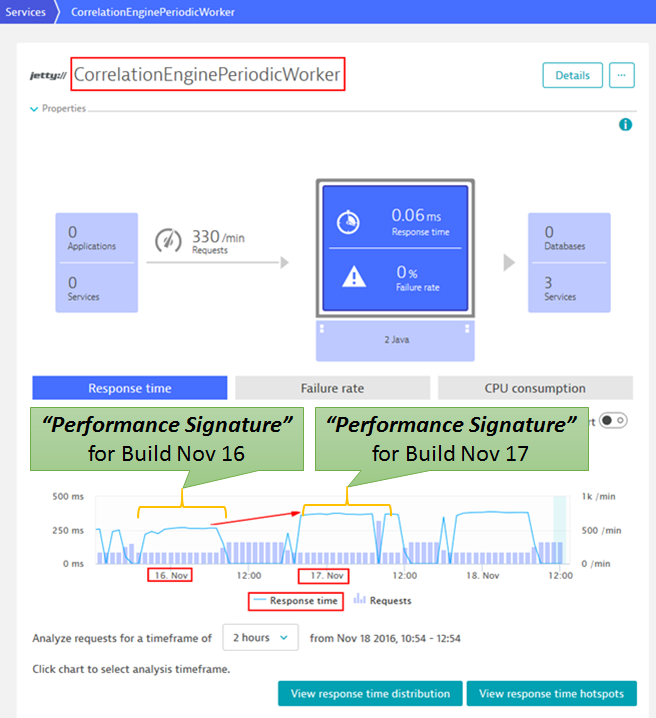 What is a “Performance Signature”? 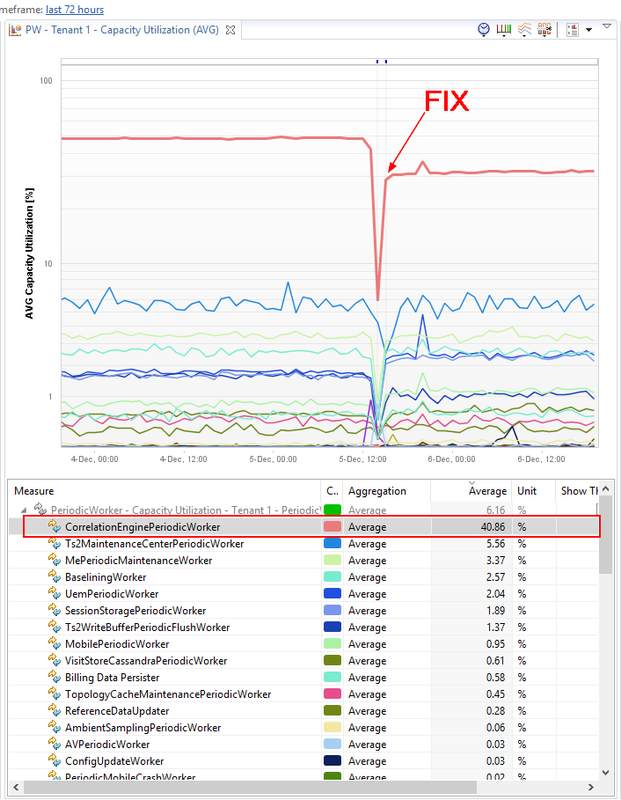 I must admit it is a term that our partners from T-Systems coined when they created the Dynatrace AppMon Performance Signature Plugin for Jenkins. I hope they don’t mind my “borrowing” this term but I think it PERFECTLY explains what we have to do in a Continuous Performance Environment. We need to “quantify” the Performance of the Service or Application Under Test is to compare it from build to build — these might be different metrics or a combination of metrics depending on what you are testing. From my perspective, the basic metrics should always be Throughput, Response Time, and Failure Rate. Additionally, we can add to these resource consumption metrics such as CPU, Memory, Network and Disk. The combination of these provides a “Performance Signature” that shows you “How Efficient Your Service/Application” is when processing a certain quantity of work load! The Performance Signature of the reverted code change was back to normal behavior. Now if you know the architecture and the code of your services and applications well enough, you immediately understand the root cause when getting this type of data presented side by side. The problematic version was simply bypassing a cache layer and always requesting data from the back end data store. That regression caused the performance regression. Continuous Performance Testing makes it possible to detect performance regressions much faster than in traditional load testing environments where you run large scale load tests at the end of a sprint or release. In combination with Monitoring you can easily compare the “Performance Signature” across builds and provide feedback to your engineers minutes or hours after they made a code check in. Thanks again to Thomas for sharing this story. Keep using our own products. Keep innovating by automating these feedback loops we so desperately need! 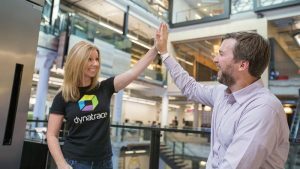 If you want to test Dynatrace on your own get your SaaS Trial by signing up here.